MEET GREG KENTON, BILLIONAIRE IN THE MAKING. Greg Kenton has two obsessions -- making money and his long-standing competition with his annoying neighbor, Maura Shaw. So when Greg discovers that Maura is cutting into his booming Chunky Comics business with her own original illustrated minibooks, he's ready to declare war. The problem is, Greg has to admit that Maura's books are good, and soon the longtime enemies become unlikely business partners. But their budding partnership is threatened when the principal bans the sale of their comics in school. Suddenly, the two former rivals find themselves united against an adversary tougher than they ever were to each other. Will their enterprise -- and their friendship -- prevail? At the end of his fifth grade year, Greg discovers that his fellow classmates have a lot of spending power. He notices that each of them has an extra quarter or two every day to spend at lunch on pencils, ice cream sandwiches and cookies. Greg is determined to get a piece of the action. All he needs is the right product to sell to them. Candy and toys won't go over big with the teachers and principal, but who could complain if he sold books to the kids? Soon Greg's Chunky Comics business is born. Greg writes, illustrates and produces the comics at home. His business takes off and he is getting rich quick. But obstacles soon get in the way of Greg's thriving business and threaten to shut him down. Will he be able to overcome these hurdles and grow his business? In this age of commercialism and consumerism, Andrew Clements --- the author of FRINDLE and a number of popular school stories --- will have readers thinking about what it means to be a success in life. Greg Kenton learns a thing or two about success, and readers will too. I wish Andrew Clements success with this delightful middle grade novel. I just finished reading Lunch Money. I am a fourth grade teacher. Within our reading program, we teach a unit on business and making money. This book will fit in perfectly. It's a great example of what it takes to get even a simple business off the ground. I was impressed with how Mr. Clements had the two main characters plead their case to convince the grown ups in charge that they be aloud to continue their business. The book is humorous and allows the reader the opportunity to understand the twists and turns of taking a seemingly simple idea and turning it into a money-making venture. Lunch Money is a cleverly written children's book. The main character, Greg, is an intrinsically motivated young man that is out for the all-mighty dollar. As a small child, Greg was in awe of money. His life-long goal is be "superrich." After spearheading several profitable businesses, Greg finds a moneymaking venture that he loves---making and selling comic books. However, Greg must tackle a few problems along the way. His biggest problem...a long-standing rivalry with a girl! This book is a great chapter book for young readers. The chapters are short, so the reading is not intimidating. Plus, Brian Selznick created illustrations within the chapters that create humor. Not only is the layout inviting for children, but also it explores practical living skills and character education. As a teacher, I found a treasure trove of possible enrichment lessons in Lunch Money. Clements' book addresses real-world math skills, work ethic and motivation, proactive problem solving, and making and maintaining friendships. Lunch Money even delves into the precious awkwardness of boy-girl relationships in elementary school. I enjoyed this book tremendously and will certainly share it with my young readers. It chose this book because it has a reputation as being a funny and interesting book. This book is considered a humorous book. The theme of Lunch Money is about a young boy named Greg Kenton who dreams about being a millionaire. Greg thinks of many ways to make money at school and at home by selling lemonade, toys, candy and comic books. The setting for this book takes place at his school and in his neighborhood. The story takes place in the United States of America, and occurs over a two year period. The plot of Lunch Money is about two enemies that decide to work together to sell comic books at school. By working together, instead of being enemies, Maura and Greg realize that they can overcome any obstacles if they work together. Since working together, Maura and Greg become rich and famous. The characters in this story are Greg Kenton, Maura Shaw and Mr. Zenotopoulous. Greg, the main character is a boy who adores money and the only thing he wants in life is to become rich. Maura is a girl who lives across the street from Greg. Mr. Zenotopoulous is a math teacher who teaches in their school and he helps them with their problems. I liked this story because it has some humor, competition and some action in it. I think the best part of the story is when Greg and Maura make a comic book. This story made me feel happy as well as sad. The story made me happy when Greg and Maura where making the comic book together. The story made me sad when Greg and Maura got in a fight. When Andrew Clements makes another book I think I will read it. In conclusion, Greg learns about financial success as well as learning about personal relationships at a very young age. Possibly the greatest book ever! If you like money and comics you will love this book. The title of this book is Lunch Money and it was written by Andrew Clements. 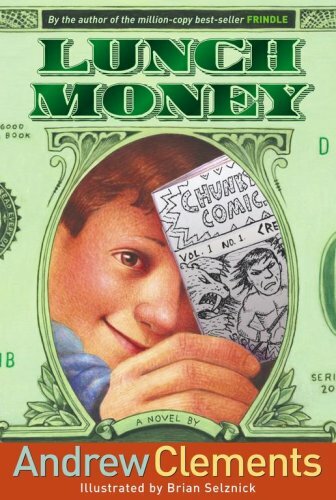 A boy named Gregory Kenton who is in fifth grade and loves money is the main character. Greg`s problem is someone is always copying his ideas. Greg knows that it`s someone he knows. Greg soon finds out that it is Maura Shaw. Greg is talented with money. In the begining of the story Greg knows he is good with money and wants to become rich. Greg has been able to earn money by cleaning his brothers' rooms. Next, he makes a lemonade stand and this girl copies him and also makes a lemonade stand. To find out what happens read this interesting book. The theme in this book is don't judge people by what they do. This book reminded me of the world because everybody wants to make money. Girls and boys in fourth and fifth grade would love this book. I read an interesting book named Lunch Money written by Andrew Clemets and illustrated by Brian Selznick. There are four main chichters. First is Greg Kenton he loves money and will do anything for it. Next is Maraw Shaw she likes to copy Gregs ideas for money.The tow last are Mr.Zenoupoulas or known as Mr.Z. Last over all is Mrs.Davenport or known as Mrs.D. There both teachers but Mrs.D is the principal of Gregs school. The biggest and best mesage of the story is not to be greedy or a hog. First off Greg loves money so he`ll do any thing for it, and he always wants more of it. So he starts businesses to get it. He first starts to do chores for his older brothers but they had to pay him. After a well he gets shut down. Then he started a lemonade stand but Maraw did something to him that he was shut down. He then started a school business and sold toys. The principle found out and shut him down. then he made the chunky comics and Maraw copied this idea. When he started to sell these comics the principal found out and shut Maraw and him down. So they worked together to present there case to the school board so they could sell the comics. Mr.Z helped them with this. Did they get permission?Did they fall? or is there another book to find the answer in? to find out read the book. Iloved this book. I also think its a must read book because its great and not confusing. It is a great kids book because its easy to read and it has big words like a height type off word not like skrumpdidalyumpsious. "Greg Kenton had heaps of talent. He was good at baseball, and even better at soccer. He had a clear singing voice, and he also played the piano. He was a wiz at sketching and drawing, and he did well at school- reading, science, music, gym, social studies- the whole deal. But as good as he was at all these things, Greg's greatest talent had always been money." Greg was good at everything involving money counting money, making money, and hardest of all saving money. Lunch Money, by Andrew Clements is a clever, fun, and humorous story about Greg and his friend Maura trying to convince the teachers at their school that comic books should be permitted to be bought and sold at school by Greg and Maura. Greg and Maura never got along with each other until they figured out that the best way for both of them to make some extra cash was to work together. They decided to write and illustrate comic books and sell them at school. To help them they asked their math teacher Mr. Z. When they all work together they can overcome any challenges that may come in their way. In result the story had an exciting plot line. One of these exciting events was when Maura and Greg were in the classroom and weren't getting along Maura reached for one of their mini comics and Greg moved his hand resulting in getting punched in the nose and having a black eye. The author, Andrew Clements is an excellent writer. He adds lots of his voice and personality into his stories. Clements will keep you guessing and laughing through the whole story. There are two essential themes in this story, friendship and the fact that you can do anything if you put your mind to it and believe in yourself. I would recommend this book to someone who likes a funny, exciting, story that will keep you on your toes. This book makes it seem like you are in the story. This would also be a good book for a teacher looking for a class read. To find out what will happen to Maura and Greg and their mini comics read Lunch Money! In each of his school stories, Andrew Clmeents manages to touch on many of the same issues, but always has something new to explore. This one is another in this great line. - The administration, of course, eventually catches wind of Greg's plan, once again throwing a wrench in the works. So what follows is a tale of two rivals finding out things they never knew about each other and thoughtful questions about school policies, courage, hard work and what's truly important in life. If you are someone who needs tips to becoming a millionaire(if you can really be a millionaire), then read this book for an amazing idea! There are also lots more books by Andrew Clements, like "The Report Card", "Frindle", "The Laundry News" and much more!